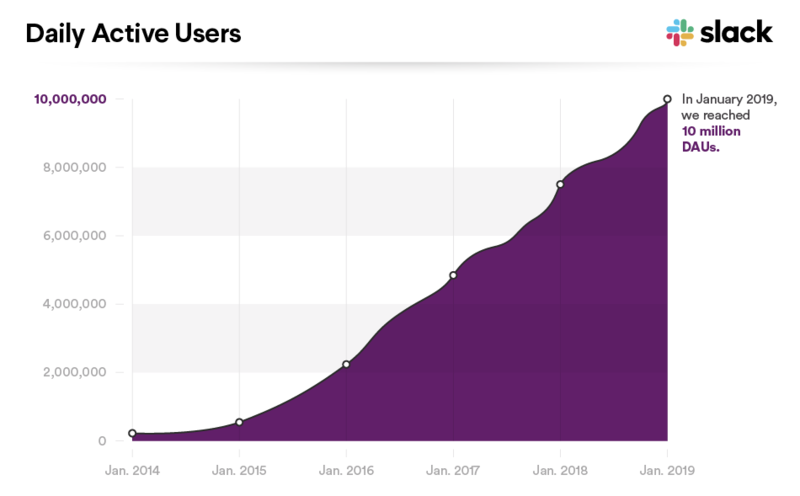 With our fifth birthday just around the corner, Slack now has more than 10 million daily active users (DAUs) around the world, further solidifying our leadership position. This growth is largely driven by demand at every level: By increasing transparency across teams and whole organizations, Slack makes it much easier to achieve the kind of alignment that makes people’s working lives simpler, more pleasant, and more productive. People experience their work becoming connected to that of their colleagues, whether they’re on the other side of the building or the other side of the world. Slack also brings people, data, and applications into a single place where people can effectively work together, find important information, and get more out of the software they use every day through integrations with Slack. In addition to the more than 1,500 apps in our directory, and integration partnerships with companies including Google, Workday, Salesforce, ServiceNow, and Atlassian, there are hundreds of thousands of customer-created custom Slack applications and integrations in active use. We are grateful for the customers who have put their trust in Slack to help them transform their organizations and be more productive. Slack is uniquely supporting teams at scale; it is used by 65 of the Fortune 100, and we’ve expanded our impact in these organizations by adding hundreds of thousands of new users within them since last year. But it’s not just these large enterprises that are changing the way they work. The number of paid customers worldwide has grown by more than 50% over the past year and now tops 85,000. These include organizations with tens of people alongside those with tens of thousands, and they span nearly every kind of work: accountants, customer support reps, engineers, lawyers, journalists, dentists, chefs, detectives, executives, scientists, farmers, hoteliers, salespeople, and all kinds of other people use Slack to coordinate election coverage, diagnose network problems, review code, negotiate budgets, plan marketing campaigns, approve menus, review job candidates, and organize disaster response teams, along with countless other tasks. Search site trivago is a gateway to more than 2.5 million hotels and other accommodations in over 190 countries, and the company thrives on an authentic, trust-based, entrepreneurial culture. To ensure that its 1,500 employees are productive and engaged, trivago’s Organizational Solutions team rolled out Slack in 2016 to replace the company’s many disparate communication tools, uniting teams and locations. Slack has played a big role in improving employee experience, from better collaboration to spontaneous innovation. For example, a custom bot called Leo asks weekly questions to measure employee sentiment about the organization and its culture, and those responses are used to address and get ahead of issues. Slack even helped employees in Düsseldorf, Germany, help others during Hurricane Ophelia in October 2017—the #duss-news channel quickly transformed into a rideshare network, helping about 100 stranded employees get home. There’s a movement afoot, an evolution in the way that people are working together. Our vision of this evolution is a world where organizational agility is easy to achieve, regardless of an organization’s size. As a result of better alignment and adaptability, less effort and energy are wasted, and the human beings on those teams are able to fully utilize their intelligence and creativity in pursuit of a shared purpose.